The cost of a college education is skyrocketing. Between financial aid and scholarships, both of us were able to graduate from undergrad with very little debt. It wasn’t until several years later that we realized how lucky we got. Fast forward a few years and hundreds of thousands of dollars of debt for grad school, and it’s easy to see it could’ve been even worse. 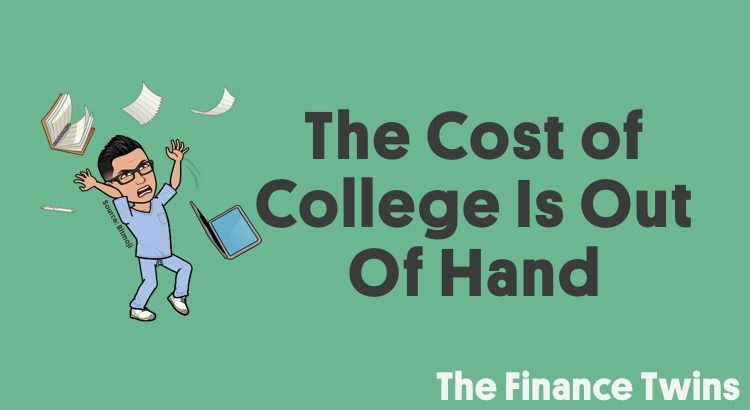 The cost of college is increasing more every year, which is going to lead to big problems. Many Baby Boomers remember working their way through college by waiting tables or washing dishes, and graduating with little to no debt. Sadly, that feat is virtually impossible in the current environment. Recent graduates face extreme levels of student debt and the main reason is the explosive increase in the cost of a college education, coupled with a lack of wage growth. The price of going to college has been increasing since the 1980s. This brings the average for all four-year institutions to $26,120 per year. Over four years, the total cost of attendance rises to an astounding $104,480. The comparable cost for the same four-year degree in 1989 was $52,892 adjusted for inflation. This means that over that time period the cost for a four year degree has doubled, even after inflation. In that stretch of time, the average annual growth rate for the cost to attend a four-year university was 2.6% per year. 2.6% growth doesn’t seem too awful, right? While the price of a degree has doubled, wages haven’t increased much since the 80’s. According to figures from the Federal Reserve Bank of St. Louis, the average annual growth in wages was only 0.3% between 1989 and 2016. That’s right, the cost to attend a university increased nearly eight times faster than wages did! Crazy, right? While the cost of a four-year degree increased by nearly $50,000, real median wages only increased by $5,000 between 1989 and 2016. Hence the nearly flat average annual wage growth rate of 0.3%. There is a glaring disconnect between the rising costs of education and the flattening of wages, which is only making it harder for young graduates to make ends meet while paying back large amounts of student loans. So What Is the Impact Of This Disconnect? 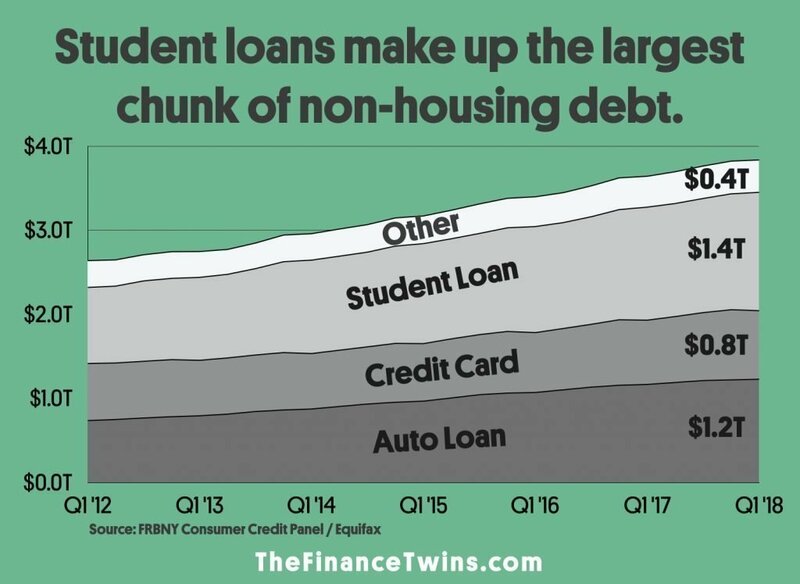 This combination of massive student loans and low wage growth helps explain why so many young adults are drowning in student debt. It also highlights the importance of understanding the fundamentals of personal finance. With a college degree often being a basic requirement for professional jobs, not getting a college degree can put you at a disadvantage when job hunting. However, starting your career with a mountain of debt is also a major disadvantage that can set you back for years. A true lose-lose unless you can find other ways to pay for college. So many people are having to choose between saving for retirement or repaying their student loans. Add in the pressure to buy a house, and it’s easy to see why savings rates are nearing all time lows. What Should Future College Students Do? For someone yet to go to college, we would advise them from going to a private college to study liberal arts, unless they have a very clear idea for what they are going to do with that degree, or will be receiving meaningful financial support from a parent or another source. This is because those degrees don’t always translate to higher paying jobs. A degree in computer science on the other hand leads to more direct high-wage employment opportunities. Years ago, it made sense to go to college to learn about the world and grow into adulthood.That no longer makes sense. If you plan to attend graduate school, that’s all the more reason you need to get your undergrad studies for as little as possible. Spending the first couple of years at a community college before transfering to a university to complete the degree, or applying for scholarships and grants to cover the cost is becoming a no-brainer. Another problem is that it’s hard to know what you want to do after college when you 18 and finishing high school. Maybe it makes sense to work for a couple of years before going away to college to save some money and better understand the investment of a degree before jumping in head first. We aren’t here to tell you that a college education isn’t worth it. After all, one of us got a masters degree at Harvard and the other an M.D., so clearly we see the value in an education. However, you must plan carefully and think wisely about which schools and which programs make the most sense financially. This is a big decision, which can be quite costly so you need to be smart about it.